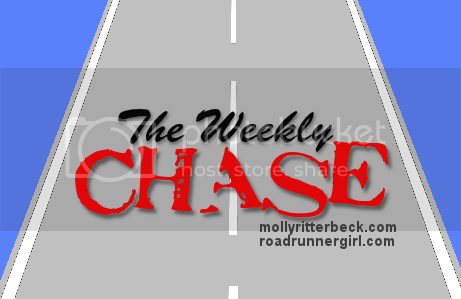 Road Runner Girl: The Weekly Chase #25! Hey all! I am having an absolute blast in Disney...although it is HOT! I just wanted to check in with you real quick today for the Weekly Chase! Did you think that because I am on vacation that I wouldn't have goals? Nope...that's not how I roll! I've got goals this week although only a few! I hope you will join us this week for the Weekly Chase! This month's challenge is called "Move Your Body!" It's summertime and I don't want us to forget about our fitness goals. This month I want you to be specific and make one of your goals a fitness goal. Your goal could be to run 3 times a week, strength or weight train twice a week, go for a walk everyday, or do at least 15 minutes of exercise each day. Whatever you want...just make it all about moving your body! Goal #1: Run at least one mile every day (challenge goal). Yep! I've even ran here on vacation! Hopefully I can keep it up the rest of the week! Goal #2: Stretch and roll every day. Yes! I made sure to bring my Stick and Triggerpoint Therapy Kit so I could continue this on vacation too. Goal #4: Line up and schedule guest posts for the blog. Check! I have some awesome guest posts lined up for you this week!!! Goal #5: Wash everyone's clothes. Check! It took me two days but I got everyone's clothes washed for the trip! Goal #6: Pack for Disney. Check! Whew! I'm glad this one is over! I LOVE to travel but I hate to pack! Especially when I have to pack for multiple people and not just myself! Goal #1: Run at least one mile every day (challenge goal). My plan is just to keep the streak alive this week. I'm not going to run anything over a mile. 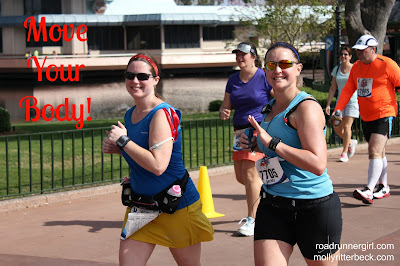 Just getting out there to run will be challenging enough! Goal #2: Stretch and roll every day. This will go hand in hand with running everyday! Goal #3: Have fun! I'm hoping we all have a great stress-free vacation with no one getting sick and everyone having a great time! QOTD: What goals do you have for this week? Do you run or workout when you're on vacation?